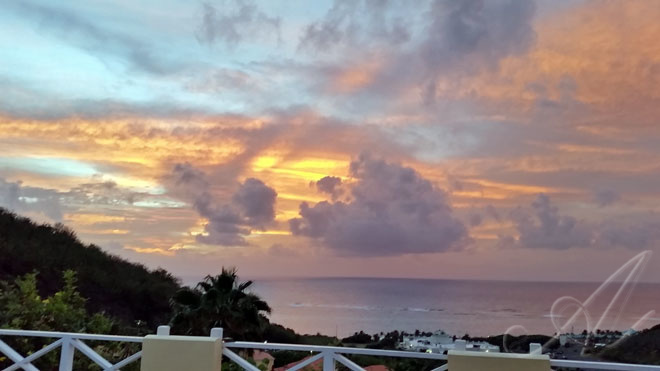 It all starts with the view! 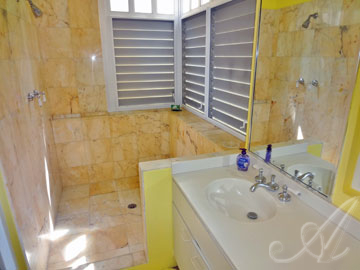 As soon as you enter the villa you are drawn out to the patio and the unobstructed view of the Caribbean beyond. 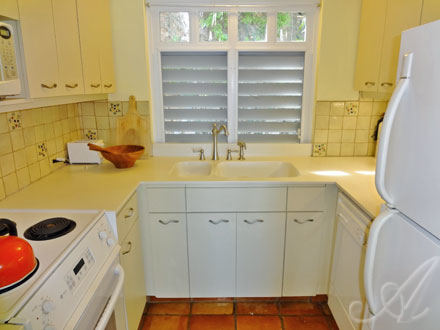 Sitting high on the hill, you overlook Villa Madeleine out to the sea. 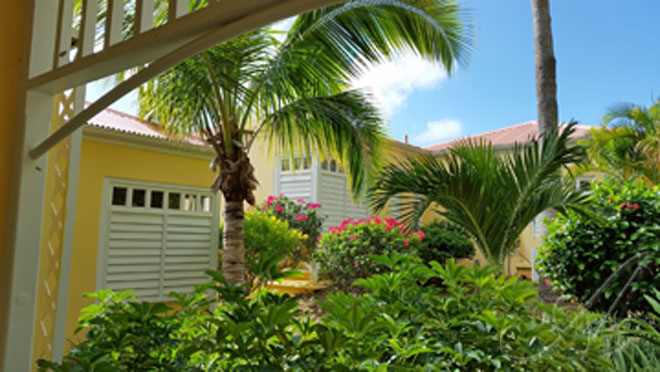 You are greeted at the lushly landscaped entrance to your vacation villa as soon as you open the door with sweeping views of the patio and the sea beyond. 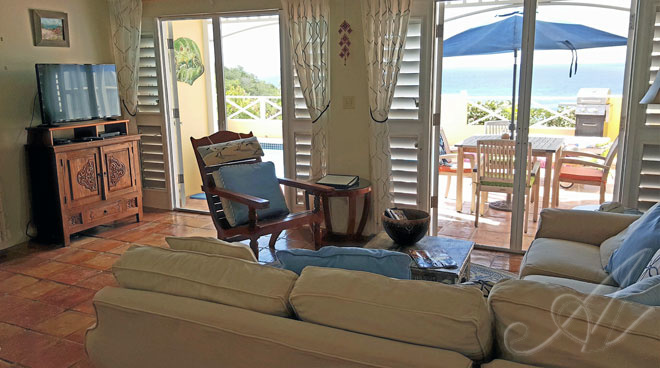 The living area features comfortable seating for kicking back while enjoying the cable TV, dining indoors or just gazing to the outside view from the double set of French doors. 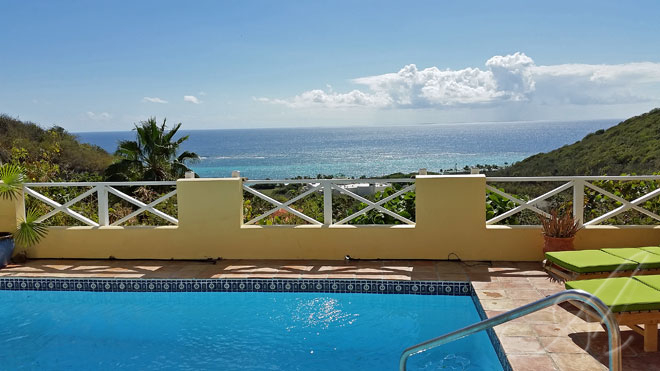 All inside villa amenities are provided including complete air conditioning and fully screened door openings and windows, Cable TV, Wireless Internet, DVDs, linens, towels, and a Gas Grill for nights at home to enjoy the ambiance. 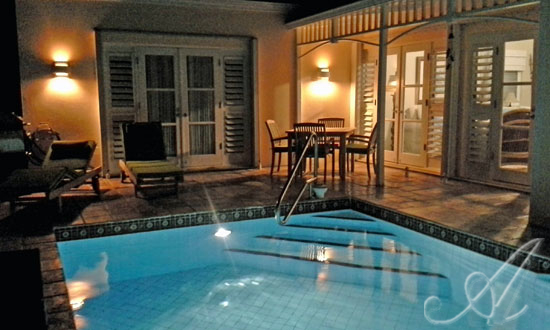 Off the great room is the easy fully equipped kitchen for light breakfasts and lunches and for special romantic dinners in. 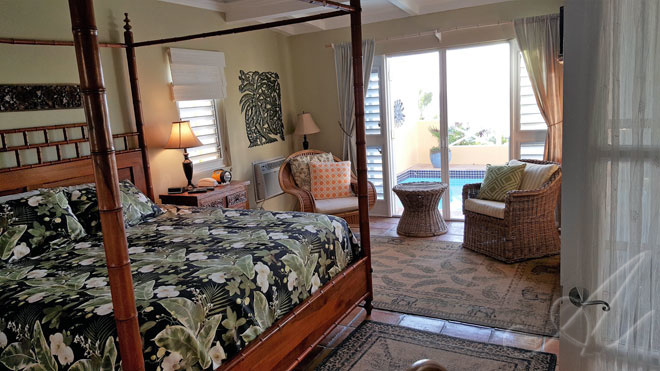 The master bedroom suite with its elegant style 4 poster King bed and large bath with marble walk in shower is accessed off the great room area and features air conditioning, ceiling fan and French doors out to the pool deck view. 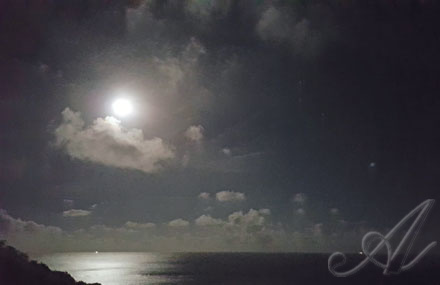 Be lulled to sleep by the sound of the ocean waves at night. 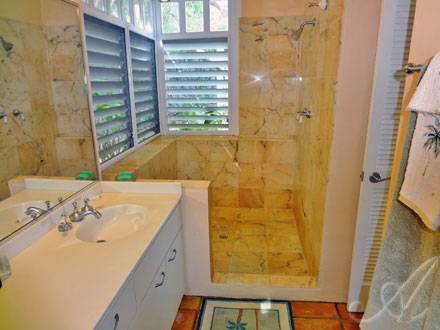 Master bath ensuite features a large walk in marble garden style shower. 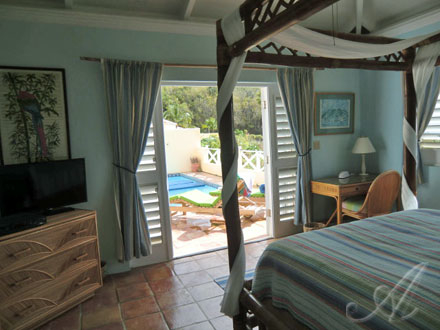 The second master bedroom suite features a 4 poster Queen bed that makes this villa nicely suitable for 2 couples traveling together or for a family with older children who don't mind sleeping together! 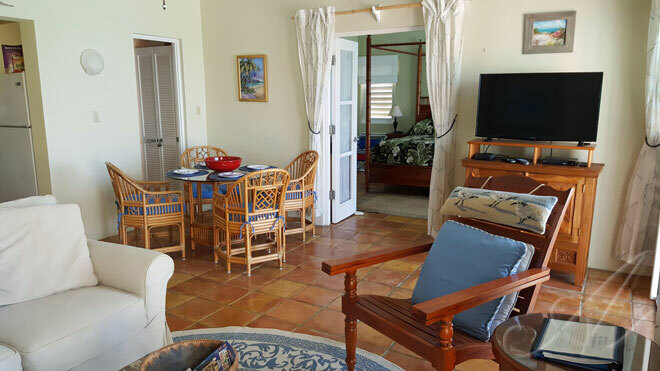 Features include ceiling fan, air conditioning, TV, private bath with marble walk in shower and French doors opening out to the pool deck. And nights are just as special. 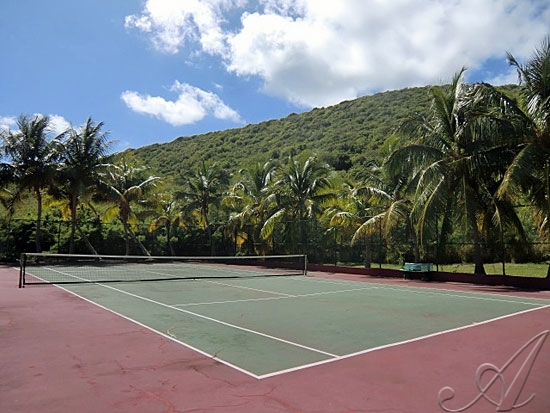 There's even a tennis court on grounds for your use. 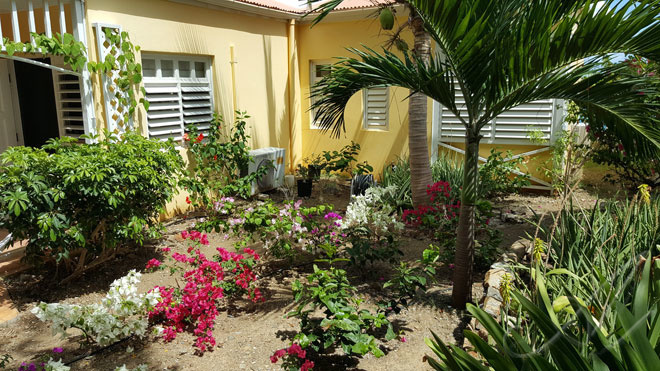 The grounds of Villa Madeleine provide a lush tropical environment, the serene and gated community villa complex is a perfect location to either kick back and relax or be on the go... the choice is yours!